I love a good white pizza because I love that super garlic-y flavor with all that oil and cheese, but then I’m like I need meat. Thankfully, all the pizza places I’ve gone to, they’re more than happy to accommodate half and half pizzas so I can always get my fill ! I was like I need to have a super garlic-y white pizza right now. So I made one and it was glorious. 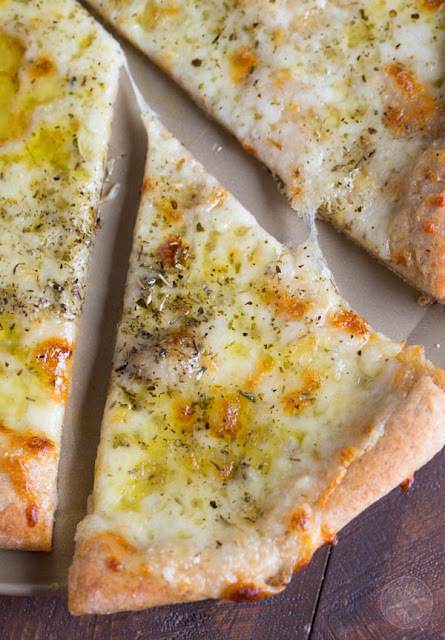 A classic white pizza with a whole-wheat blend crust is the perfect cheesy, oily, and garlic-y pizza for any day of the week! Using your hands, gently stretch the dough in the pizza pan. Leaving a 1-inch border from the edge, brush olive oil and minced garlic all over the dough. It's okay if the minced garlic doesn't cover all the space. Sprinkle mozzarella cheese all over top then the Italian seasoning and salt.